Bring your family, your pet, some friends, and still find plenty of room for rest and relaxation in this 3,100 square foot 5 bedroom, 4.5 bath raised single home. Bring your family, your pet, some friends, and still find plenty of room for rest and relaxation in this 3,100 square foot 5 bedroom, 4.5 bath raised single home. 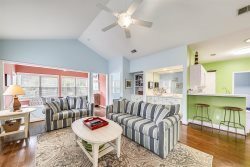 Enjoy the great outdoors in the fenced rear yard with private pool, which can be heated for an additional charge, wet bar and charcoal grill, lounging on one of the three porches, or during a short 10-minute walk that will lead you to the beach. Your indoor time will be just as enjoyable when you indulge in the available amenities. The gourmet kitchen has barstool seating for 4, in addition to a separate breakfast area. The dining room is spacious and well suited for the formal evening meal. The large sunny living room will provide just the right ambiance for evening gatherings. The master suite, located on the 2nd floor, has a king-size bed and private bath with Jacuzzi tub. Bedrooms 2,3,& 4 all have queen beds and the 5th bedroom has 2 double beds. In addition, the home has 7 TV's, 2 of which have 32" flat screens, and wireless internet access. There are 6 DVD's and 2 VCR's. Thank you for the great service and care. The stay was great! We will definitely stay with you again next time we visit Hilton Head!